2. 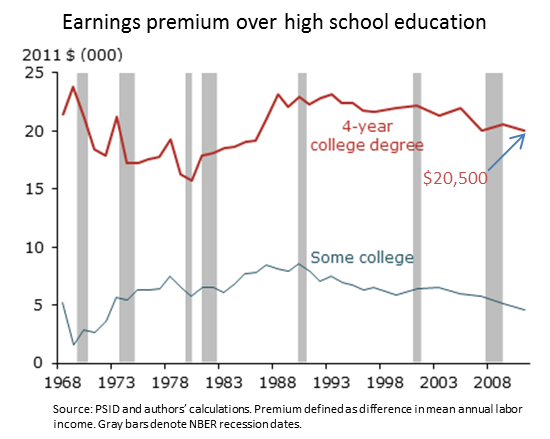 Faster Earnings Growth: While the initial difference between annual earnings of high school and college graduates is modest, that difference over time is magnified (see chart below). For those who graduated in 1990s-2000s, the difference grew from $5,400 in Year 0 to $26,800 by Year 10. 3. $80,000 Degree Pays for Itself in 20 Years: Okay, so 20 years may sound like a long time to recoup the cost of a college degree, but once the expense has been paid off, college graduates go on to accumulate on average $830,000 more in lifetime earnings than high school graduates. 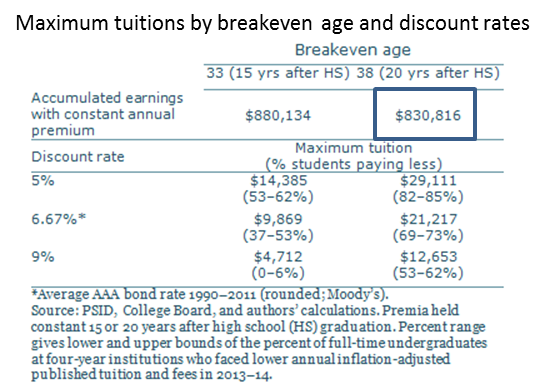 One of the interesting concepts that study authors Mary C. Daly and Leila Bengali make use of in their analysis is the “breakeven amount” of annual tuition needed to equalize the accumulated net earnings of a college and high school graduate, 20 years into the future. What does that mean, exactly? Well, think of two high school graduates who each take separate paths. One goes directly into the workforce and the other on to college. If we followed up with both 20 years later, which student, on average, would have accumulated more net earnings? Depends, right? And on a lot of factors. But let’s focus in on the cost of the degree. In their answer, Mary and Leila estimate that an annual tuition expense of $20,200 equalizes the accumulated earnings between the high school and the college graduate. In other words, if a college graduate paid $80,800 in total tuition, their accumulated net earnings would be equal to the high school graduate by age 38. But what if tuition was lower? With lower annual tuition costs, it takes less time to pay off the cost of college investment and you reach the breakeven point in less than 20 years. 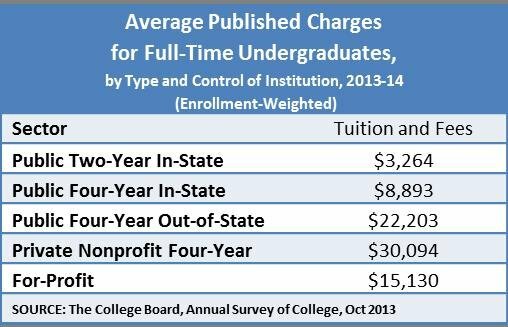 And on the other side of the calculation, higher annual tuition results in a longer payoff period. One of the key takeaways from this analysis is to think carefully about tuition costs and impact of those cost on future earnings, (see table below). In addition to the insightful analysis, Mary and Leila developed a tuition calculator that lets you explore the relationship between tuition, number of years to break even, and the discount rate used in the estimation. 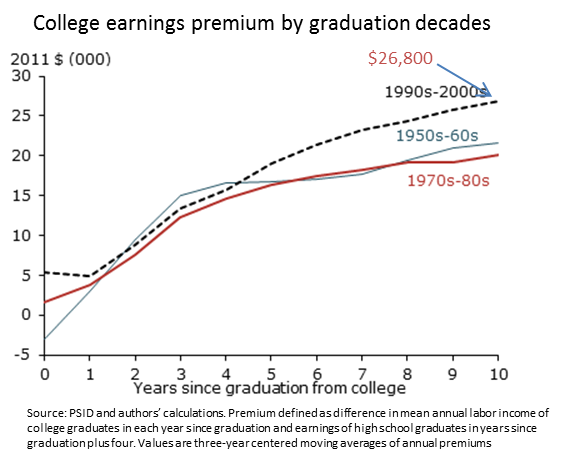 And remember, once the investment in the degree is paid off (by age 38 in these examples) the earnings premium over a high school graduate are a net gain to the college degree holder. Using the earnings premium 20 years after graduation of $28,650 per year (for graduates in the 1990s-2000s), a college graduate can expect to accumulate about $830,000 more than a high school graduate (see table below). The numbers in this study are striking and you may be curious about the data and the analysis. The full article can be found here on our web site. If you happen to be in the Bay Area this summer, please join us on August 15, 2014 for our Meet the Experts program featuring a talk by one of study authors, Mary C. Daly. We would love to have you join us! This entry was posted in Research and tagged college, data, debt, education, money. Bookmark the permalink. Do you have any statistical information on student loan debt compared to income earning potential with a degree? Thanks. Thanks very much for your question and you bring up an important issue around student loans. The Pew Foundation just released results from a new survey titled “Young Adults, Student Loans, and Economic Well-being”, that provides some comparisons between college graduates with and without student loans, really interesting stuff. And, the NY Fed has a great resource on consumer finances, including student debt that you might also find helpful. And finally, a blog post from Liberty Street Economics, also at the NY Fed, highlights housing market differences in younger workers with and without student loans. Do you have any information on the amount of student debt compared to earnings after graduating? Thanks.